Hike up to Lake Agnes, one of the most popular hiking trails. Though it’s not one of the longest hikes and is easily completed in half a day, Lake Agnes is the perfect place to take a rest, enjoy lunch, or perhaps stop by the teahouse. Built in 1910, the log cabin is the perfect place to sit and enjoy the view while sipping a cup of tea or snacking on the baked goods, made fresh each morning. If you’re feeling rested, and replenished, circle around Lake Agnes and up to the Beehive Gazebo for breathtaking views of the surrounding area. Still ready for more? Take the highline trail to the Plain of Six Teahouse. A little larger than the Lake Agnes Teahouse, this one boasts the same warm cups of tea and baked goods. Enjoy the views of six different glaciers, as well as the occasion sights and sounds of a far off avalanche. It’s all downhill from there as you hike back down to the lake, finishing your day with the fairly flat stroll from the back of beautiful Lake Louise, watching the Chateau gradually grow as you reach the end of your adventure. Want to experience Lake Louise and Moraine Lake but aren’t so much of a hiker? If you tend to be more of a water baby, a canoe is ready and waiting for you. 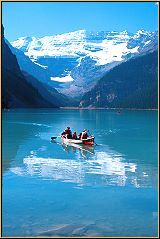 With canoes available for rental at both lakes, this could be the romantic excursion of a lifetime or a family adventure never to be forgotten. For those whose thirst for adventure cannot be quenched by a canoe water fight, then don’t hesitate to take the next step from the flat water of the Lakes to the rapids of the Kicking Horse River, on your very own Wild Water Adventure. If hurdling through the class IV rapids of the Classic trip isn’t enough of a thrill for you, embark on the Maximum Horsepower trip, with class IV+ rapids it will take you on a ride you won’t ever forget. If you’re feeling a little intimidated by the larger rapids, or want to make it a family affair and bring the children the Gentle Journey is calling your name, however don’t be fooled, gentle or not, you will get wet! Up, up and away… soar to the top of the world on the Lake Louise Gondola. This fourteen minute ride in either traditional enclosed gondola cars or an open chair takes you to an elevation of 6850 feet, leaving you with panoramic views of the surrounding mountains… and, if you look closely enough, even a glimpse of Lake Louise itself. Complete your journey by embarking on one of the several simple hikes or partake in one of their interpretive programs as you learn about local animals and how they survive. Perhaps you’ll even be lucky enough to glimpse one of these animals as you ride back down. Please join us for our “Great Divide” Interpretive Presentations on selected evenings starting mid-June in our sitting room. Joel and Nadine create experiences you won’t find in any guidebook. Their presentations are full of knowledgeable information, interesting and FUN. It will only enhance your vacation experience and provide you with an evening that’s entertaining and informative. If you have a sense of humour and want to learn a bit more about the area, it’s a MUST!